Pat Summitt earned respect for women's sports, but we still aren't giving it. Many former players, plus the Tennessee governor, attended Summitt's private funeral today. Fans celebrated the life of Summitt at a candlelight vigil last night. Lafayette coach Theresa Grentz's tribute. Texas Tech's Marsha Sharp honors Summitt. Cierra Burdick's tribute to her college coach. A thank you to Summitt from Massachusetts attorney general Maura Healey. The gifts of Pat Summitt were also academic. Wins and titles don't define her impact. Summitt's influence in the Chicago area went beyond victories. Breaking down the Mystics' hot stretch. Jewell Loyd's improved game has the Storm on the rise. The Dream's Tiffany Hayes is under the radar. Q&A with the Liberty's Amanda Zahui B. Dawn Staley isn't afraid of Zika. A month ago we presented a statistical analysis of the WNBA's top 20 players. Then the W came out with their list. Now we revisit the top 20. Pat Summitt changed the world, but was never too busy to worry about her players. Tamika Catchings on Summitt: "she remembered me." Mercury rookie Isabelle Harrison talks about her former coach. Rutgers coach Vivian Stringer remembers Summitt. LaChina Robinson podcast discusses the legend. Reflections of a ride begun at the Lady Vol Creation. The Tennessee athletics community shares Summitt memories. Texas A&M mourns her passing. Auburn fondly remembers a legend. Texas statements on her passing. Arkansas reflections on a legend. Summitt's peers remember what made her a legend. Summitt's connections went way beyond basketball. Her legacy: 1,098 wins, countless women empowered. Summitt lived with a passion and a purpose we could all stand to emulate. Summitt meant everything to the game of basketball. Summitt played a major role in Lynx coach Cheryl Reeve's coaching journey. Summitt is a lasting face of a devastating disease. The Liberty pushed and overtime to edge the Lynx, 95-92. That's three consecutive losses for the defending champs. Sugar Rodgers had a career-high 30 points, as she stepped up for Tina Charles, who sat out. Tamika Catchings lead the Fever over the Sky, 95-83, with 26 points. 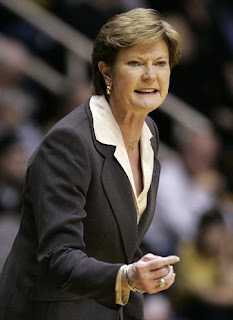 She was playing for Pat Summitt, she said later. The Mercury beat the Sun, 86-75, for their third straight win. The Mystics routed the Stars, 84-67. Here they come: the Mercury are finally clicking after a slow start. The Storm's recent trade signals they're readying for a playoff push. Liberty center Tina Charles is putting together another MVP-caliber season. Could the Final Four move back one week? The Division I Council has introduced legislation to expand the women's basketball committee across five regions instead of four. Courtney Ekmark has left UConn and transferred to Arizona State. Former WNBA great Yolanda Griffith is a new assistant coach at UAlbany. Nick Moore is a new assistant coach at Bowling Green. Australia has cut the Storm's Abby Bishop from their Olympic team. Breanna Stewart is excited to join Team USA. The WNBA reveals new player EMOJIs this morning. How does a mountain disappear? Summitt's legacy will stand the test of time. The single ingredient in leadership, according to Summitt. Why we owe Summitt a big thank you. Tennessee residents are paying tribute to the legend. Join Tamika Catchings and friends for her exclusive post-game Legacy Tour Fundraiser Event at NIKE VAULT at Staples Center following the LA Spark vs. Indiana Fever game. The purpose of this fun filled event is to celebrate Catchings’ career accomplishments and contributions both on & off the court during her final WNBA season. Throughout her 16 year career, Catchings has worked as tirelessly in the community as she has on the court with her Catch the Stars Foundation (CTSF). Tamika founded Catch the Stars Foundation (CTSF) in 2004. CTSF is a 501(c) 3 non-profit organization with the mission of empowering youth to achieve their dreams by providing goalsetting programs that promote Literacy, Fitness & Mentoring. Through the Legacy Tour, the Foundation’s goal is to raise $100k to support their goal of expanding its programming to 11 new cities in 2017. In partnership with WNBA Cares, CTSF will provide $2,000 in grants to community organizations in each of the 12 WNBA cities. Your $24 ticket purchase through this offer includes:  Entry to Tamika’s private party at NIKE VAULT at Staples Center after the game  Limited edition Nike Legacy Tour t-shirt  Access to participate in a Silent Auction & Raffle of one-of-a-kind autographed items  An opportunity to get Tamika’s autograph, photo, and learn more about Catch the Stars Foundation  Please note that this ticket does not include a game ticket. Text CATCH24 to 50155 to Donate to CTSF! The Sparks rallied from behind to beat the Wings, 89-84. Candace Parker had 31 points for Los Angeles, including 25 in the second half. The Sparks have tied the 1998 Comets for a WNBA best to start a season after 15 games, as they are now 14-1. Storm rookie Breanna Stewart posted a career-high 38 points to carry her team past the Dream, 84-81. So Pat dies and two Lady Vols get waived? Wow. Tamika Catchings speaks: Pat, my leader, mentor, hero and inspiration. What a heartfelt, beautiful piece by Catchings. It illustrates exactly why more than 50 of her players, young and old, rushed to her bedside, drove all night, flew across the country, slept on floors, and sat in the hallways of a retirement home, where they passed the time playing bean bag games with seniors, just to see her and whisper a few words in her ear. Winning is fun . . . Sure. The time Pat got furious and took over a Tennessee men's practice. Holly Warlick says Summitt was about helping women to be their best. Sparks forward Candace Parker says that from now on, she'll play for Summitt. Thank you, Pat Summitt, from one Tennessee girl to another. Summitt was "just Pat" to many. An emotional Chamique Holdsclaw recounts Summitt's impact. Princeton coach Courtney Banghart's Summitt story. Tennessee's first women's athletics director reflects on Summitt. Lady Vol coach Holly Warlick's thoughts on Summitt. The friendship and rivalry between Summitt and Texas coach Jody Conradt sparked the ascent of women's basketball. The Lynx were honored at the White House today for winning the 2015 WNBA Championship. It was their third time there for that honor in five years. Obama praised the Lynx for setting an example for young girls. The Dallas Wings need to work on defense. Atlanta waived Cierra Burdick and signed Markeisha Gatling. What? Finally healthy, Storm guard Sue Bird is enjoying a career resurgence. Sun forward Chiney Ogwumike is unapologetic. The Orlando terrorist attack has struck a chord with Dream guard Layshia Clarendon. Dallas forward Karima Christmas looks to continue her hot streak. Kelsey Bone had a whirlwind 24 hours after getting traded to Phoenix Saturday. Storm rookie Breanna Stewart won the Honda Cup for best collegiate athlete last season. Tina Charles and Diana Taurasi are the Eastern and Western conference players of the week. Lynx coach Cheryl Reeve is still advocating for equity and respect for women. Candace Parker and Glory Johnson reflect on playing for Pat Summitt at Tennessee. Details on Tamika Catchings' visit. Geno Auriemma and his former UConn players are pulling for Summitt. How Summitt changed the role of women in sport. The time Summitt considered becoming Kentucky's coach. What Rio doesn't want the world to see. Australian coach Tom Maher guided China to the Olympics - his sixth as a head coach. China aims for a top eight finish at the Games. The news began to break last night that legendary Tennessee coach Pat Summitt's health had been declining over the past week. Hospice had been called in to the retirement home she had moved to in January, and family, friends and former players had begun to show up. I was having a horrible deja vu moment, and people around me were puzzled at how Alzheimer's Disease can kill a person. I realized that we are educated about the memory loss (early stage) part of the disease, but not about the final stages of this loathsome condition. I recently had a crash course on this subject myself. It was April 26 when I got the call. An immediate family member with Alzheimer's Disease had been almost 100 percent uncommunicative since January. In April this person stopped eating and drinking, and was losing weight. When the hands and feet began turning blue and blood pressure became elevated, they called us. My relative could die that night, the next night, or a week from that time, they said; they didn't know. But hospice was called, as it was for Pat. Last night it was said Pat "might not make it through the night." That's what they told us too, about our relative. Alzheimer's begins by destroying memory, and it continues to short-circuit the switchboard of the brain until it gets to neurotransmitters that run major organs and bodily systems. When limbs turn blue and heart rate changes, that's a sign that the circulatory system is being shut down. Alzheimer's can close down any part of the brain, so final stage symptoms vary from person to person. I've been told by reliable sources that Pat began declining shortly after her birthday, June 14. She's been asleep for more than a week, but opened her eyes today. That indicates she will pass soon. But when is anyone's guess. The limbo period is torturous. On one hand, you don't want your loved one to go. On the other hand, you want him or her to be at peace and free of suffering. And every single time your phone rings you hold your breath, because it could be that call. The day my family member died - May 8 - my sweet nephews had come to visit. They leaned over the unconscious body and showered hugs and kisses. Four hours after they left, my relative died. Family, friends and former players are making the trek one more time to see Pat Summitt - the woman who will never be replaced. I am wondering if she will have a similar exit to my family member, as there are spiritual realms that we don't understand with the conscious mind. Besides praying for Pat's peaceful passage, I am also praying for the family, friends and athletes. Having to wait for that call is hellish. Last night, word began to get out about legendary Tennessee coach Pat Summitt's further decline in Alzheimer's Disease. This morning, several stories surfaced, which I linked here. Lots of love coming Pat's way on social media. Summitt's statue in Knoxville stands for more than wins and titles. Say what? The Mystics whooped the Lynx, 87-63. Minnesota is now 13-2. Meanwhile, the Sparks took care of the Sun, 80-73, behind Nneka Ogwumike's 27 points. LA is now 13-1. Across the country, the Mercury halted the Liberty in overtime, 104-97. Candice Dupree had 26 points for Phoenix. But that didn't stop the Liberty reunion from being very successful and fun. Times are changing, thank goodness. More and more basketball players are coming out, as they feel safe enough to do so. That open Storm roster spot? Seattle is again choosing old friends, by signing center Krystal Thomas. Mystics coach Mike Thibault has done it all in his coaching career. Oregon State lost some stars to graduation, but it's only the beginning for the program. Miami coach Katie Meier is confident the Hurricane coach's tips will help her team. Kelsey Byrd is a new assistant coach at Cal Poly. She is surrounded by family and some former players. Pat Summitt through the years. No words. Just deep, cavernous sadness. As the dust settled in Minnesota and Los Angeles, it stirred up in Phoenix, Connecticut and Seattle, where all three franchises were wheeling and dealing today. The Mercury traded Noelle Quinn to Seattle in exchange for the rights to Angel Robinson. Phoenix traded Courtney Williams, Jillian Alleyne and a 2017 second-round draft pick to Connecticut for Kelsey Bone. The Storm also waived Blake Dietrick and Markeisha Gatling, leaving one open spot on their roster. And in case you missed it, the Mercury signed Lindsey Harding yesterday and waived Nirra Fields. That's a lot of transactions. So Seattle gets Quinn back, but is Angel Robinson showing up in Phoenix anytime soon? The Bone trade makes a lot of sense for the Mercury, but what does the Sun get out of it right now? Does this mean they've given up on the season already? Who else will the Storm sign? The Stars got past the Dream, 73-69, on the strength of Kayla McBride's 28 points. Where has the Dream's momentum gone? They've won two of their last seven games. The Fever snapped the Wings' four-game winning streak by taking them down, 92-87. Indiana saw a line up change going into the match up. Becky Hammon's jersey now hangs from the rafters at AT&T Center. The Liberty's Shavonte Zellous describes how basketball can be a safe haven for LGBT players. The Duncanville high school star is excited to play in Dallas. A'ja Wilson is taking the spotlight at South Carolina. Tuesday the Lynx snapped the Sparks' winning streak at home, and tonight Los Angeles returned the favor, handing Minnesota their first loss of the season, 94-76. - The Lynx looked really tired at the end of the game. - I haven't seen the Sparks look this good since the 2006 season. - Over 13,000 fans at Target Center! Alright, Minnesota!! - I hope both teams stay healthy, because this is fun! - Next match up between these two is Sept. 6, in LA. - The officiating sucked big time, though. The Mercury defeated the Mystics, 91-79. Diana Taurasi scored 27 points to eclipse the 7,000 mark for her career, as the fastest player to do so. The Liberty edged the Sky, 80-79. Tina Charles led New York with 21 points and 13 rebounds, despite breaking her nose in Wednesday's game. It's the sixth straight win for the Liberty. The Storm cruised past the Sun, 98-81. Seattle rookie Breanna Stewart had 29 points, tying her career high. The WNBA is raising money and awareness for Orlando shooting victim families. Tamika Catchings is enjoying her farewell tour. Liberty center Tina Charles won the May WNBA Cares Community Assist Award. Becky Hammon didn't enjoy an easy road with the Stars. Former WNBA big Quanitra Hollingsworth has found a home playing in Turkey. For Vanderbilt coach Stephanie White, things are shaping up. Armintie Prince returns to Ole Miss as coordinator of player engagement. Dalila Eshe is a new assistant coach at LaSalle. Hailey Yohn has been promoted to assistant coach at High Point. Elena Delle Donne spreads that message. Good for her. It's the only way we're going to make any gains. Stanford coach Tara VanDerveer talks gender bias in college sports. Dallas has won four in a row, and is hitting their stride. Maya Moore is excited for the Rio Games and isn't concerned about the Zika virus. ....just beat the Czech Republic, 72-63, in the U17 World Championship games. How many are we up to now this season in the WNBA? Wings 97, Stars 90, in OT. Looks like Dallas has turned a corner. ....will feature part II of the Sparks vs. the Lynx, this time in Minnesota. The game will be on NBA TV at 5 p.m. Pacific, 7 p.m. Central. Maya Moore, who pulled a hamstring in Tuesday's game against LA, will be a game time decision for the Lynx. If Moore doesn't play, it'll be the first time she'll have missed a game due to injury. Those from the class of 2011 are tough.....Sparks forward Jantel Lavender has also not missed a game. Minnesota's Natasha Howard is playing with and inspiring confidence. Lauren Jackson will return to Seattle July 15 for her jersey retirement ceremony. Storm fans are HYPED. Q&A with Becky Hammon before her jersey retirement Saturday. Florida Gulf Coast has added two transfers. The contract of Central Michigan coach Sue Guevara has been extended through 2020-2021. Nadine Domond has resigned as Grambling's coach. Former Butler head coach Beth Couture is Purdue's new assistant coach. Ashley Barlow is a new assistant coach at Wright State. What's up with all the overtimes?? The Liberty outlasted the Dream in two OT, 90-79. Atlanta had been on a 9-0 run. On the upside, Sancho Lyttle returned to the Dream today, and showed off her versatility. The Mystics used a strong fourth quarter to top the Fever, 76-62. Washington is now back to .500. I was on Ed Easton Jr.'s "keeping it real" sports show earlier today, talking about yesterday's historic Sparks-Lynx game, and more. If you missed it, you can listen here. President Obama will honor the 2015 WNBA champion Minnesota Lynx at the White House Monday. After a difficult road trip, the Storm are eager to make improvements. Mercury fans have raised more than $14,000 for the OneOrlando Fund. Going vintage clothes shopping with Mystics center Stefanie Dolson. The Stars will retire Becky Hammon's jersey Saturday. Natasha Cloud talks about the Mystics' new found focus at home. Washington rookie Kahleah Copper answered a rapid fire questionnaire. Ohio State graduate Lisa Blair joins Kansas as a graduate, with one year of eligibility left. Former Cal guard Gabby Green has transferred to LMU. Semeka Randall joins Wright State as an assistant coach. Deneen Parker is a new assistant coach at Northwestern State. Australia is close to naming their Olympic team. I get into yesterday's game IN DEPTH. An epic showdown it was between the Sparks and Lynx today. It was a huge, highly-anticipated game that lived up to every bit of the hype that preceded it. In the end, Minnesota pulled out a 72-69 win. My story will be posted shortly, but here are my pregame interviews. Dallas beat Phoenix again, for the second time in four days, 100-90. Skylar Diggins had 20 and Glory Johnson 16 and 10 rebounds for the Wings. The Sky got past the Stars, 81-75. Elena Delle Donne led the Sky with 23 points. The Liberty have signed Australian forward Rebecca Allen. Dallas guard Odyssey Sims is glad to be back in her hometown. Stars rookie Moriah Jefferson is learning to accept losing in the WNBA. Mercury rookie Courtney Williams is adjusting to life in the league. Wings forward Glory Johnson wasn't happy with the language used by Phoenix fans against her and her team Saturday night. The Pac-12 has made a splash in recruiting this year. Towering newcomer Felicia Aiyeotan will bolster Virginia's front court. Syracuse transfer Danielle Minott has landed at Eastern Michigan. Former Alabama center Oceana Hamilton has transferred to Northwestern. Drexel has dismissed Alexis Smith for violating team rules. Vanderbilt's Carolyn Peck is a superstar assistant coach. Keith Freeman has been promoted to associate head coach at Wright State. Mike Groulx is a new assistant coach at Canisius. FIU has hired Joe Silvestri as an assistant coach. McNeese State's coaching staff is complete. I will be on Sports Social with Ed Easton at 1:20 p.m. Eastern tomorrow. Tune in! All very deserving players, and I have no overt objections to anyone on the list. But I would have replaced Siemone Augustus and Cappie Pondexter with Delisha Milton-Jones and either Chamique Holdsclaw or Angel McCoughtry. Voting for the league’s WNBA Top 20@20 presented by Verizon will be conducted by a 15-member committee composed of women’s basketball pioneers Carol Blazejowski and Ann Meyers Drysdale; current and former WNBA head coaches Van Chancellor, Michael Cooper, Anne Donovan and Cheryl Reeve; and media members Doris Burke, Doug Feinberg, Mel Greenberg, Melanie Jackson, Howard Megdal, LaChina Robinson, Michelle Smith, Mechelle Voepel and Pam Ward. For a 100 percent stats-based look at the WNBA top 20, womenshoopsworld.com did one a month ago. Both teams are putting their undefeated records on the line tomorrow. Will the Sparks upset the Lynx? LA has surged with the return of Candace Parker. Comparing the unbeaten Lynx and Sparks. It was 100 degrees in Los Angeles today, and it's supposed to get there again tomorrow. I can't even tell you how glad I am that I'll be in iced-out Staples Center tomorrow. The Mercury get a second crack at the Wings on two days rest. The league will announce its top 20 players of the first 20 years at 7:45 a.m. Pacific/10:45 a.m. Eastern tomorrow morning on SportsCenter. Picking the top 20 makes for tough choices. The Wings took another step forward Saturday, in beating the Mercury. Kiah Stokes is finding her comfort zone with the Liberty. Wings guard Skylar Diggins is getting married. Former West Virginia Mountaineer Bria Holmes is finding success in the WNBA. The Fever waived reserve guard Brene Moseley. Tina Charles and Candace Parker are the Eastern and Western conference players of the week. Former Mississippi State forward LaKaris Salter has transferred to Jacksonville. Former Oklahoma State guard Sydney Walton has transferred to West Texas A&M. ODU has added Hofstra transfer Kelly Loftus. Katherine Graham is a new assistant coach at Virginia. JMU's new assistant coach is Ashlee McGee. Ross Jolly has joined Radford as an assistant coach. Sabrina Ionescu's high school and club coach, Kelly Sopak, was offered a coaching job at Washington, which he turned down. Ionescu was considering the Huskies along with the Ducks. Dana Evans will replace Crystal Dangerfield, who is injured, on the U18 team. Even if you don't watch NBA basketball, like myself, you most likely have been aware of the Twitter firestorm that resulted from Ayesha Curry's comments last week. This isn't just about Ayesha, though. Overt and subtle sexism exists from Twitter to SBNation to ESPN, and drives women to the margins of sports. The ideas that women need to be subservient to men, that women are seen but not heard, and that women are weak, all lead into a narrative that women aren't welcome in NBA culture. Men in sports have been conditioned to distrust women's voices to protect their masculinity. Men are more worried about being shown up by a woman than hearing what women have to say. This results in mansplaining, exclusion, and invisibility. Ayesha is not infallible, and that's okay. But because NBA fandom mistakenly thought she fit some invented "ideal", she's become the target of misogyny and harassment on Twitter (never look at her mentions). For women, mistakes are blown out of proportion, and the margin for error is that much tougher. Misogynistic men thought Ayesha Curry was that "perfect", loyal girl that wouldn't friendzone them and would stay in line, and they're angry now that Ayesha has shown she's just like any woman. There's no easy solution to misogyny. The first step is clear, though: men have to start listening to women as individuals, rather than viewing them as accessories or embodiments of who men want them to be. Wow. So many incredibly accurate points. 1. "Overt and subtle sexism exists from Twitter to SBNation to ESPN, and drives women to the margins of sports." Over the weekend I was tweeting a stranger, and he disagreed with me. He must have looked at my profile because he suddenly started to diss women's basketball. That's just like race or gay baiting/taunting. The Sparks have broken the WNBA record for best season start, and the LA Times has written one story on them so far this season. Margins, indeed. 2. "Men in sports have been conditioned to distrust women's voices to protect their masculinity. Men are more worried about being shown up by a woman than hearing what women have to say. This results in mansplaining, exclusion, and invisibility." Profound observation for a young man. He could teach many older men some things. Women need to speak up more, and continue to push the envelope. Too often, they back down for fear of being disliked or disenfranchised. But if women stuck together, that wouldn't matter (because it doesn't). 3. "For women, mistakes are blown out of proportion, and the margin for error is that much tougher." Of course. NBA players can brawl on court, brawl in a bar in a city they're playing in, break a hand fighting on their own time, and feel no repercussions. WNBA players don't smile enough and they've got a bad attitude. Racial/ethnic minorities, women and LGBT folks have to work three times as hard to be considered just as good. The #@$% is old. 4. "There's no easy solution to misogyny. The first step is clear, though: men have to start listening to women as individuals, rather than viewing them as accessories or embodiments of who men want them to be." And women have to stop allowing others to treat them as accessories. If you like the WNBA, be about the WNBA. Who cares how many "likes" it gets, or who else loves or doesn't watch the league. Social media has made many people even more dependent upon the approval of others than they already were. The weakening of personality that has resulted is something everyone needs to step away from. Sexism is so powerful that it affects not only female athletes, but the wives of male athletes. Don't just sit there: fight back. The Sparks have taken on Buddha qualities this year. Tomorrow's game against the Lynx should be fun. The Lynx took down the Storm, 96-84, to remain undefeated and set a new WNBA record for most consecutive wins to start a season. The Liberty squeaked by the Fever in overtime, 78-75. The Sun edged the Stars, 93-90, to snap a three-game losing streak. Mercury center Brittney Griner responded to Father's Day trolls on Twitter last night. Belarus cruised past Korea to claim the last spot at the Rio Games. Lindsey Harding will compete in the Olympics for Belarus. Abby Bishop has left the Storm to pursue her dream of playing for Australia in this summer's Olympic Games. Geno Auriemma is getting ready to coach the U.S. Olympic team. No. 4 recruit Sabrina Ionescu has signed with Oregon. The Wings rallied from 17 behind to force not one but three overtimes. They won, 117-111. Epic game. I'm tired from watching three hours and 20 minutes, and I didn't even play. It was the second triple overtime game in the WNBA this week. Four Mercury players fouled out. Both teams had a combined 65 fouls, which broke the previous record of 57. And now the Mercury have another losing streak on their hands. Over the last eight games, they've won two, lost two, won two, lost two. Dallas needs to bottle that mental toughness and start selling it. They could make some money. The Mystics blew out the Dream, 95-65. What???? Didn't see that coming. The Fever look to avenge their worst loss of the season tomorrow. Miranda Drummond is leaving St. Bonaventure for Syracuse. The Sparks beat the Mercury, 77-71, to go 11-0 and match the WNBA record for best season start. The Lynx just set the new mark Tuesday night. Candace Parker lead four Sparks players in double figures with 24 points and 11 rebounds. The two teams face off Tuesday in Los Angeles. Angel McCoughtry helped the Dream close out a win over the Sky in overtime, 101-97. The Fever defeated the Stars, 84-75, behind Tamika Catchings' 23 points. The Dream are finding ways to win close games in 2016. Liberty forward Swin Cash is soaking in her final year in the league. Spain, France, Turkey and China have all clinched spots at the Rio Olympics. The last Olympic team will be decided Sunday. Parise Rossignol has left Maine. 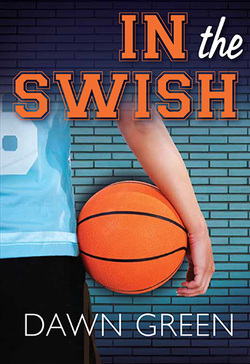 North Carolina coach Sylvia Hatchell's new book is a bestseller. Melissa Brooks is a new assistant coach at Army. Julie Kaufman has joined Niagara as an assistant coach. SIUE's new assistant coach is Dodie Dunson. Hot game on deck tonight. Check out my latest feature on SLAMonline about pro franchises waiting for injured players. Interviews with Tamika Catchings, Natalie Achonwa, Izzy Harrison, Chelsea Gray and Jillian Alleyne featured. The Liberty beat the Sun, 80-72. Tina Charles lead New York with 32 points, and teammate Swin Cash broke the 5,000 career points barrier. Despite a career-high 29 points from Storm rookie Breanna Stewart, the Wings topped Seattle, 88-79, to end a six-game losing streak. With an 11-0 stars, even more Minnesota fans are catching Lynx fever. The Fever aim to end their losing streak against the Stars Friday. The Mercury head to Los Angeles to play the undefeated Sparks tomorrow. Storm forward Breanna Stewart is paying tribute to the Orlando victims on her shoes. Swin Cash is trying to stay in the moment in her final WNBA season. Dream guard Carla Cortijo is embracing her role as the WNBA's only Puerto Rican-born player. Natasha Howard personified the Minnesota Lynx. After battling many injuries in her career, Sparks guard Alana Beard is seeking a title. Liberty center Tina Charles is a finalist for the Sports Humanitarian of the Year Award. Twenty years later, a look back at the league's first game. Michigan State has added two-time transfer Shay Colley. Morgan State coach Donald Beasley is on leave after players allege verbal abuse. Jamila Ganter is a new assistant coach at Houston. Quinnipiac's new assistant coach is Destini Hughes. LaSondra Barrett is a new assistant coach at FIU. Tim Taylor is Virginia's new assistant coach. New Providence coach Jim Crowley has announced his staff. Hartford has two new assistant coaches. The Liberty have waived Lindsey Harding. DelleDonneDesigns by Elena Delle Donne will have you amazed by the MVP all over again. Get to know Mystics guard Natasha Cloud. The WNBA's own MVP list for the week has a certain Nneka Ogwumike at the second spot now. Ogwumike has broken a league record for field goals made. Storm coach Jenny Boucek is glad her team is travelling to Dallas instead of Tulsa. Oregon coach Kelly Graves is excited about the Ducks' incoming recruiting class. The Lynx routed the Fever, 87-63, to go 11-0 and break the WNBA record for best season start. The Sparks downed the Sky, 98-85, to go 10-0 and break the franchise record for best start. The Mystics outlasted the Sun in three overtimes, 109-106. The Liberty edged the Wings, 91-88. The Stars outlasted the Storm, 77-70. Sparks forward Nneka Ogwumike, the Western Conference player of the week, had 27 points and 12 rebounds. She was one of five Los Angeles players in double figures. Sun guard Alex Bentley put up 31 points. Liberty center Tina Charles scored 28 points. Stars and Storm rookies lead the way for their teams. Moriah Jefferson had a career-high 19 for San Antonio and Breanna Stewart put up 19 for Seattle. It's Pride night in Los Angeles tonight, for the Sparks game and in New York, for the Liberty match up. Though scheduled long ago, tonight's festivities come just two days after the horrific Orlando massacre inside of an LGBT night club. The Liberty's Shavonte Zellous, in a powerful essay "I am Orlando," writes about how her sister was on her way to the club but got a call to come into work the next morning, and changed her plans. The Fever are looking to avoid a three-game losing streak tonight. The Lynx are deeper and fresher going into tonight's game. New faces have lead the Dream to the top of the East. Wings forward Glory Johnson is downplaying the match up against former wife Brittney Griner this Saturday. Fever rookie Tiffany Mitchell is thriving in the WNBA. Jordan Hooper is soaring with the Wings. Rookie Rachel Banham is bringing a "mamba mentality" to the Sun. Kentucky coach Matthew Mitchell says writing his team off next season would be a mistake. Top recruit Sabrina Ionescu is down to Oregon and Washington as her finalist schools, and will decide soon. New book about girls basketball: "In The Swish"
Bennett Ryan is a superb young basketball player who propelled her team to a regional championship. But in her senior year she discovers there's a lot she doesn't know. She has to switch schools, for one thing, and learn to fit in with the team she helped to defeat in the finals the previous year. What's more she confronts a far more complex world than she's been used to - a new friend who is on the autism spectrum, as well as teammates from a diversity of cultures. Finally she has to face her old team-and some old assumptions-in a dramatic playoff game. Purchasing and other information is here. The Lynx are on the verge of breaking their own record for best season start. Will both the Lynx and the Sparks remain undefeated by night's end tomorrow? St. Joseph's product Natasha Cloud is enjoying life in the WNBA. The Storm's Crystal Langhorne: another week, another blog. Nneka Ogwumike and Emma Meesseman are the Western and Eastern conference players of the week. Two jobs, one Stephanie White. No problem. Podcast with Liberty coach Bill Laimbeer. Some of the NBA's top players shout out the WNBA and its athletes in a new video. Liberty point guard Lindsey Harding and Belarus are set for Olympic qualifying this week. Australian star Michele Timms will be inducted into the FIBA Hall of Fame. Kansas State coach Jeff Mittie seeks a faster pace from the team. A recent Philadelphia high school graduate, Akyra Murray, was one of those killed in the Orlando nightclub shooting early Sunday. She was set to play basketball at Mercyhurst University. Despite a huge fourth quarter Indiana rally, the Storm edged the Fever, 90-88. Tamika Catchings posted 27 points for Indiana, and Jewell Loyd 20 for Seattle. The Mercury's come-from-behind effort worked: they topped the Sky, 86-80. Diana Taurasi headed up Phoenix's efforts with 31 points. The Dream outlasted the Sun, 93-87. Elizabeth Williams had 20 points and 10 rebounds for Atlanta, while Layshia Clarendon added 19 points and 9 assists. The Mystics still don't feel right at home after last night's loss to the Lynx. The Dream's Elizabeth Williams proved her value in today's win over the Sun. A closer look at Candace Parker's career year from downtown. The 1996 team got women into pro basketball in the U.S.
12 teams will compete in the FIBA Olympic Qualifying Tournament for the last five available spots. Seimone Augustus not only returned to the court from injury, but she scored 21 points to lead the Lynx over the Mystics, 83-76. Minnesota had another slow start, as they did in last night's game, but won to go 10-0 and tie their own league record for best season start. The Sparks are right behind them, after a 97-73 win over the Wings for a 9-0 start. Nneka Ogwumike headed up LA's efforts with 32 points and 10 rebounds on 12-for-12 shooting (what?). The Sparks have tied the franchise record. Meanwhile, the Liberty used a late-game rally to push past the Stars, 90-75. A six-year-old girl gave the Mercury a clinic on dribbling. Candace Parker is providing the perfect start for the Sparks. The Mercury are preparing for Elena Delle Donne and her offense. Pat Summitt's stand 26 years ago helped launch inductee Sherri Coale's career. Coale and fellow inductee Jackie Stiles reflect on Summitt's impact on women's basketball. Lauren Hill was honored, as was the 1996 Olympic team. The Olympians are confident in the future of women's pro basketball. Pioneers in the sport look back at the progress it has made. The Sky defeated the Fever, 73-64. Rookie center Imani Boyette had her first pro double-double. The Fever were "out of sync." A last-second Alyssa Thomas tip-in lifted the Sun over the Storm, 77-76. It was a heartbreaker for Seattle. It was all Lynx in the second half, as they turned a one-point halftime lead into a 110-78 romp. Minnesota is now 9-0, which is one game short of their own record of 10-0 to start the 2012 season. To tie that mark, they'll have to win in Washington TOMORROW. For the Mystics, home court has provided little comfort. Dallas needs a full return from Skylar Diggins to right the ship. Tayler Hill's offseason workouts have become monumental for Washington. George Mason welcomes two transfers. The Hall will honor Lauren Hill with an inspiration and courage award. The Mercury silenced the Stars, 90-75, lead by Diana Taurasi, who had 31 points. Lynx forward Seimone Augustus did indeed sustain a concussion in Tuesday's game against Phoenix. Dallas Wings forward Glory Johnson showed glimpses of her old brilliance in her return to the court last night. Emma Meesseman has been magical for the Mystics so far. Fever rookie Tiffany Mitchell is proving doubters wrong. Storm rookie Breanna Stewart is excited for her homecoming against the Storm tomorrow. A sellout crowd is expected. Stewart is adjusting to losing in the WNBA. USA Basketball will host a four-team exhibition tournament on the east coast in preparation for the Games. The team plans to dominate at the Olympics. For the Lynx Olympians, the risks of Rio are worth it. The American Conference has a new scheduling model this fall. Megan Huff has transferred to Utah from Hawaii. Former Ole Miss forward Kelsey Briggs has transferred to Houston. Kenya Pye is transferring from New Mexico, while Latesha Buck is transferring to New Mexico from Green Bay. Notre Dame coach Muffet McGraw addresses the lack of diversity among college coaches. As Loyola Chicago investigates, coach Sheryl Swoopes said she did nothing wrong. Quinnipiac coach Tricia Fabbri's contract has been extended through 2020-2021. St. Louis coach Lisa Stone's contract has been extended. Chenel Harris is a new assistant coach at Arkansas. Glenn Box is a new assistant coach at Indiana. Steven Fennelly is Idaho's new assistant coach. Ebony Haliburton is a new assistant coach at UC Irvine. Wisconsin has two new assistant coaches. A closer look at the 2016 class.